Have you ever wondered from where where the phrase 'The Devil is in the Details" comes? I mean we all know it and most folks have used it at least once, but have you ever stopped to wonder who first used it? I do (does that make me strange?). Read to the end of the post and I'll give you an explanation. In the meantime, the devil was in Albany today. He was at the NYS Board of Regents meeting. The regents were all discussing how to implement the new teacher evaluation system. Among the several topics they considered? Just exactly how much should the observations from the "Independent Evaluator" be worth? The NYS BoR, you see, gets to determine it. They do this by asking the different stakeholders (the major unions, school districts and large organizations) what they think. They board make a decision. As it so happens, a teacher-parent-advocate from Ulster County, and steering committee member of NYSAPE, was was there watching the proceedings and Bianca Tanis noticed something interesting. 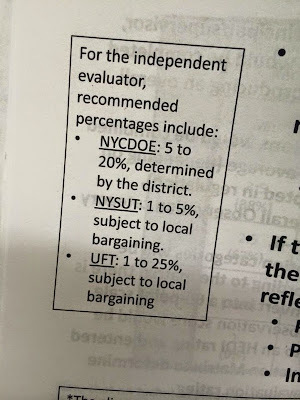 It seems the UFT wants these evaluators to count for as much as 25% of that portion. That's more than even the NYCDOE wants it to count! The NYCDOE would like this independent evaluator to count for 20% of the observation (aka 'subjective') portion of the evaluation. The UFT wants it to count for as much as 25%! 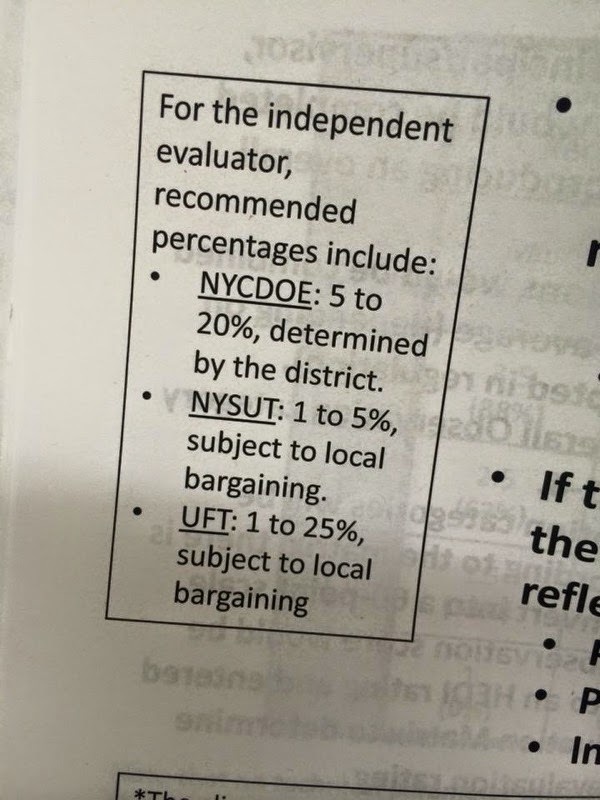 Compare this with NYSUT who wants it to count for no more than 5% (2.5% of a teacher's overall rating) and you just may realize that my local -the UFT- wants this independent evaluator disaster more than any other group in the state. Below is the picture Ms. Tanis took detailing what each of the largest organizations in the state would like to see. NYSUT: "1-5" NYCDOE: "5-20" UFT:"1-25"
The UFT stated repeatedly that they were opposed to the governor's new evaluation system plan? Opposed? It looks to me like the UFT got just what it wanted! The UFT wants independent evaluators -those strangers who walk into our classroom to tell us whether or not we're good teachers- to be worth one quarter of or observation score. UFT to teachers: Drop Dead. Anyway, give up on the phrase? Most places I checked credited 19th Century French Writer Gustave Flaubert. Apparently, he once wrote that 'God' is in the details and that the phrase evolved to 'devil' over time. That's a lot like the UFT. It once was a union that fought for protections for teachers in New York City and the union evolved over time --into a reform organization that is fully funded by teachers through their dues. Just the phrase -New Teacher Evaluation System- brings a snarky smile to my face. We've seen so many 'new' teacher evaluation systems since 2011 that it is almost impossible to speak the last three words of the phrase and not begin with the first. The current "New" teacher evaluation system (passed as part of this year's budget) turned one month and 12 days old yesterday. And on this same day, with many folks not paying much attention, a decision seems to have been reached new teacher evaluation system is quite the -how can I state this- disaster. The Education Committee has released yet another new teacher evaluation bill that is sure to be an improvement upon the (42 day) old teacher evaluation system (the Perdido Street Blog caught it on on State of Politics). Just like it's predecessors, this "new" teacher evaluation system suggests some fairly significant changes to how teachers are going to be evaluated next year the year after next. Districts will be allowed to compel teachers submit some type of project as part of the observation score if they (and their union) choose. You heard it here! And districts will be able to allow more measures, other than a test, to count for the second 20 (formerly known as the state 20) of a teacher's score. So, for districts who choose to use a local measure (and that will be the New York City DoE) an option to use additional measures, other than the one test, will exist. Gee what fun. I can't wait for our "new" teacher evaluation system to start! Bowie fans, click here. One other change requires a brief note: The VAM Formula that the state uses will now have a few new categories by which to compare students. Students will now be compared with other students across the state in groups of" DISABILITIES, POVERTY STATUS, ENGLISH LANGUAGE LEARNER STATUS AND PRIOR ACADEMIC HISTORY"
I leave this as a post script because I always presumed that the state's VAM model compared students along these lines. It is, after all, supposed to be the whole flipping point of VAM! !